Upson County draws from a seven county contiguous area including Meriwether, Pike, Lamar, Monroe, Talbot, Taylor and Crawford Counties which includes a labor force of 61,734. Our skill set strength is in advanced manufacturing and the diverse industrial base offers employment opportunities in injection molding, wire molding, food processing, textiles, printing and logistics. The Thomaston-Upson School System (K-12) and specifically Upson-Lee High School have various opportunities in the academic arena including a Ninth Grade Academy which operates as a school within a school. The advanced placement, honors programs, sixteen CTAE (Career, Technical and Agriculture Education) pathways and dual enrollment programs give students a head start on workforce skills and demands. The graduation rate at Upson-Lee High School is 87.4%. Southern Crescent Technical College offers a state-of-the-art campus with a $6 million training center as well as on-line courses for students wanting to enhance their skills. Programs in Business Technology, Allied Health, Industrial Programs (welding, automotive, industrial systems, mechatronics….) are popular with additions coming in Registered Nursing, Logistics Management, Electrical Line worker and Film Production. SCTC has a dual enrollment program for students at Upson-Lee and the availability of a bus to transport the students from the high school to the technical college makes it convenient. The Thomaston-Upson Chamber of Commerce sponsors Manufacturer’s Roundtable each month. This breakfast meeting enables local industry/maintenance leaders to collaborate on workforce issues and opportunities such as the career expo for Upson-Lee juniors and seniors. Quad Graphics donated equipment and $10,000 for a Graphics Design Lab at Upson-Lee High School which will enable students to get early instruction and training on relevant equipment in the printing and design sector. Dart Container’s Foundation awarded a $99,000 grant to Southern Crescent Technical College to be used for the mechatronics lab on the Flint River Campus in Thomaston. The funds from the grant will be used to purchase trainers that will allow students to learn cutting edge technical skills such as robotics, Ethernet communication, advanced PLC and voltage frequency motor drive operations. The commitment by our local industries ensures the present and future workforce that available training can jumpstart them for employable skills in our community. 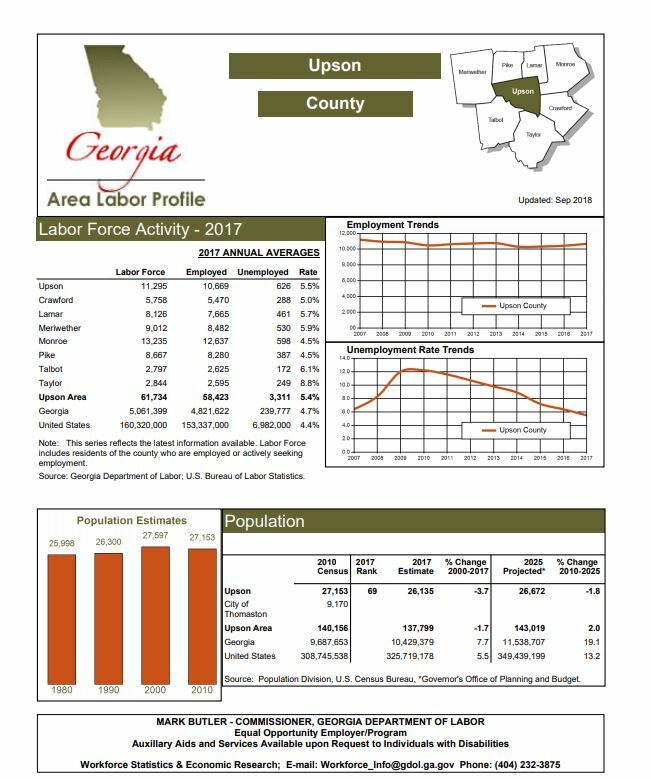 For a wide variety of the most recent information on Upson County’s labor force activity, please visit https://dol.georgia.gov/get-labor-market-information (under “Related Sources”, click “Local Area Profile” for Upson County).